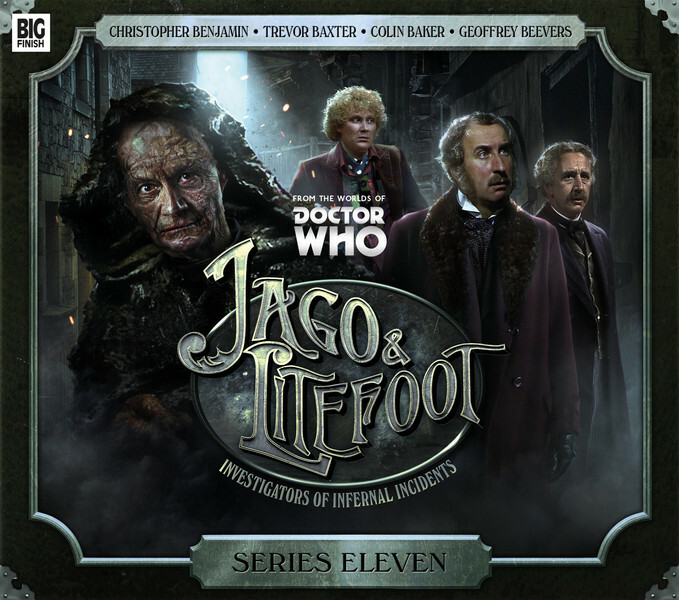 Big Finish: JAGO & LITEFOOT, Series 11 Review | Warped Factor - Words in the Key of Geek. There are two headlines that’ll get you to buy Jago & Litefoot 11, even if you’re not a fan of the series. The first is the big picture of the Geoffrey Beevers Master on the cover (no it doesn’t count as a spoiler because there’s a big picture of him on the cover), and the second is probably the title of episode 1, which it also doesn’t count as a spoiler to tell you is Jago & Son. As a longstanding fan of the series, it gives me no pleasure to tell you that neither of these headlines really delivers at the level they should. Jago and Son by Nigel Fairs kicks us off this time with a story of Satanists, strange diseases, even stranger evolving beasts in the Underground, a college ‘friend’ of Litefoot’s, and the title draw – the previously unsuspected son of Henry Gordon Jago. There’s some doubt as to whether Junior is actually who he thinks and claims he is, but the dynamic between ‘father’ and ‘son’ is a familiar one to anyone who’s ever watched Scooby Doo with the insufferable pup-in-search-of-a-severe-beating-with-a-spade that is Scrappy Doo. Junior has always heard that Henry Gordon Jago is an adventurer par excellence, and he’s all for carrying on the family business, running headlong into scrapes, sure that his Pa will find a solution to any problem. If nothing else, this conviction gives James Joyce’s performance a kind of incorrigible, loveable oomph, and gives the character of Henry Gordon Jago Junior the notional ability to do anything, sure as he is of the proud and noble adventurous stock from which he springs. More endearing in the long term is Rowena Cooper as Jean (who once passed herself off as John) Bazemore, the college friend of Litefoot’s, who it’s hinted he had feelings for until the disaster of her gender was made plain to him. Cooper has a fantastic voice for this character, and Fairs gives her enough oomph to become a potential returning character – half Evelyn Smythe, half Ace. While she’s given a more formal farewell at the end of the story than is HGJ Junior, we’d love to hear more of the exploits of Jean Bazemore – she could even be a kind of Victorian Bernice Summerfield, because yes, she’s another glorious archaeologist in Big Finish’s line-up. Really, the thing that lets Jago & Son down most is the way it’s left to drift to no real conclusion at the end. People vanish, and instead of hot-footing it in pursuit, Jago, Litefoot and Bazemore decide that, having averted a kind of devastation – though not with their usual level of completeness – everything else will sort itself out in time, and a quick stop at the Red Tavern will make everything seem much better. It’s as though Jago & Son is part 1 of a two-part story, but part 2, if it exists, doesn’t find a place within this four-story box-set, so, in a way not dissimilar to on-screen clunker Sleep No More, it leaves the listener with a sense of ultimate pointlessness and the necessity of hanging about until the second part is eventually provided, when it’s to be hoped part w will actually make some more sense than it does at the moment. That said, Jago & Son is a positive romp compared to Maurice, episode 2 of J&L 11. Matthew Sweet’s entry into the series should probably be filed under the ‘just freakin’ weird’ category. It looks like it’s going somewhere interesting, with the Master beginning to make an appearance about town and running into the highly enigmatic Maurice Ravel, who carries a very distinctive pocket-watch. But long before the end, the whole thing goes distinctly literary and surreal, with hanged men, dead horses, moons that come to steal your tongue and something creepy scuttling about under the sand of Maurice’s terrarium. It’s more exhausting than enjoyable, though the idea of Litefoot meeting interesting young men and going back to their homes for supper is crucial to the drama, while adding one of the more explicit notes of characterisation to our favourite Victorian pathologist. Will you listen to Maurice more than once though? Very probably not – the surrealist imagery is tiring and again, the solution seems to be going somewhere but then very pointedly doesn’t. For his part, Geoffrey Beevers delivers his usual standard of performance though, which means he’s the most enjoyable thing in episode 2 by some considerable distance. The Woman In White by Simon Barnard and Paul Morris takes us rather more back onto traditional Jago & Litefoot territory, with a double historical celebrity episode. This time, we meet the greatest actor of the age, Sir Henry Irving, played in an extraordinarily evocative vocal performance by Edward de Souza, and Abraham (Bram to his fans) Stoker, theatrical manager and friend of the ever-reliable Henry Gordon Jago. While taking the name of a novel by a different author altogether, The Woman In White is intended to be inspirational of Stoker’s vampire novel, Dracula, and it contains many of the elements you need to make such a story convincing, with Sir Henry babbling about his Master and eating flies, pale creatures absorbing the life essence of others and passing their infection on, seductive women in catacombs, exceptionally dehydrated cadavers and more. The Woman In White serves up what is a fairly standard ‘aliens who’ve been here forever’ story, while delivering plenty of punch and brio in its direction by Lisa Bowerman, and vaguely riffing on a couple of on-screen Who stories, such as The Curse of the Black Spot and Ghost Light. Whether you think that’s a good thing of course depends on your assessment of those stories, but while The Woman In White feels almost like a two-hour special episode, that’s mostly down to the toing and froing that goes on en route to the solution, and also to some extent to de Souza’s performance, which is both lively and evocatively unpleasant at the same time. It feels longer as you’re going through it than it does when you look back on it, but it’s the first point in this box set at which you feel like you’ve both heard a complete story and that you’d go back and listen to it again for pleasure. And so to Masterpiece by Justin Richards, the capstone of the set. The stories leading up to Masterpiece have all had the Master in them, but rarely in a particularly engaging or centre-stage way – his best moments up to this point being the last five minutes of Maurice. Here though, Beevers’ Master steps out of the shadows, with a plan that, for the Master, is fairly straightforward – lure the Doctor to Victorian England, steal his artron energy to restore his own decaying body. Along the way though, he’s happy to take aim at Jago and Litefoot, and Richards is entirely unafraid to get his Greel on, bringing a Talons of Weng-Chiang vibe to the final episode. Oddly then, as Jago and LItefoot are increasingly drained of energy and vitality across the course of the episode, so the listener’s attention and capacity for giving a damn seems to dissipate with them, and the final solution when it comes feels predictable from the heavy hints the Doctor gives throughout the final sequence. In fact, so heavy are those hints, it makes us respect the Master less that he doesn’t pick up on them, and ends up being less a Masterpiece than a reproduction – pleasing, but nothing like as special as it claims to be. The by-now expected thread left dangling at the end of episode 4, which pulls us forward into the next box set is not bad by any means, though it takes a moment to connect it to an event earlier in the story, and nor does it engender the same kind of fan-froth that has made Jago and LItefoot listeners wait for Series 11 with baited breath. In terms of delivering on that excitement though, the excitement that the Master’s involvement in the world of Jago and Litefoot promised at the end of Series 10, Series 11 never really reaches the potential we hoped it would. It’s not a bad series of Jago & Litefoot, but neither is it the kind of series you slip through in an easy hurry and then immediately loop back to the beginning to appreciate all over again. We’d perhaps hoped that the Master could have been a Victorian criminal mastermind, using his skills and his personality to carve a swath through society, only we the listener knowing the truth of his identity, a kind of faux-Moriarty to our adventurers while he waited for his real prey to arrive. Series 11 is not that by any means – the first two stories barely feature him, and it’s only in episode 4 that he truly comes into his own. Buy Series 11 by all means – but check your expectations at the door.